The iconic image of Wally’s hat and black rimmed glasses have featured through out the project’s broadcasts. 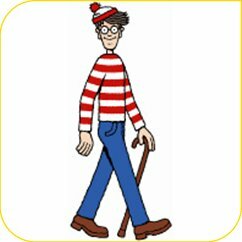 In honor of the event Open All Hours and my desire to learn how to use Grandma Davies’ knitting machine I am running a Wheres Wally competition. If you spot Wally’s red and white hat or black glasses at any point during the 24 hour broadcasts then you can win an Empisal Knitmaster made hat from the archive. You may choose a combination of any two colours from the wool box in the archive and they will be spun into a woolly striped hat of your very own! All you have to do to win one is to email the archive at: instabilityinstability@yahoo.co.uk with your contact details, postal address and the date and time you spotted the hat or pair of glasses. We will check the information on the documentation and contact you re: head measurements and preferred colours. N.B receipt of this prize is dependent on how quickly I learn to use the knit machine and master the art of making hats, but rest assure as the feature Thinking and Doing Workbooks discusses I may take a long time to complete some projects but I never forget!